Zoho Mail Tasks help you to stay on top of your To Do lists. It allows you to create and track both individual tasks and group tasks. Individual Tasks are tasks which you need to do individually. You can create and track individual tasks under My Tasks. When you create Tasks, you can set up due dates, reminders, and priority for the tasks. You can mark a Task as Complete or Reopen a completed task from the list view directly by clicking the Change Task Status icon. 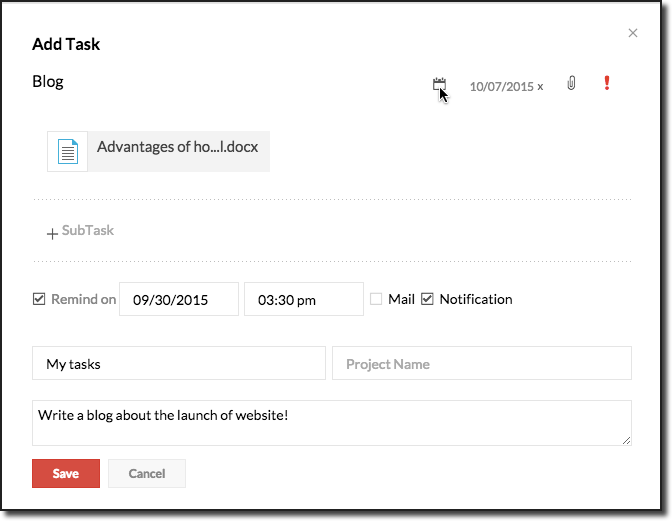 You can also add subtasks to any Task from the list view. When you create Tasks under Groups, it will be accessible by all the members of the Group. You can assign the task to any member of the group. Group Tasks can also be assigned to any organization member who is not a part of the group. 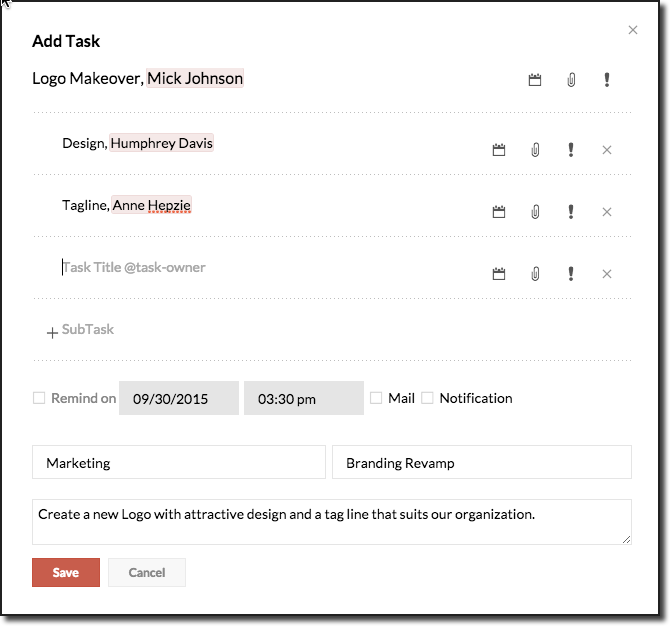 You can create multiple Tasks under a Project, and create multiple subtasks under each main Task. You can select a Project when you create a Task or create a new Project directly from the Add Task view. Projects are available only for Group Tasks. While all the group members can comment and like any task, users with different roles within the group are given different levels of edit permissions for group tasks. The table given below is an overview of the same. *Edit permissions for Parent task and sub-task include Editing the Task description, Title, Due Date, Priority and Recurring options. Permissions to add invitees to a task are subjective to whether Refuse Invitees has been chosen for that particular task. When you create Group Tasks, you can group the Tasks under Projects. This makes it easier to track the complete set of related tasks. This provides a visibility for the entire Group about the project tasks, pending items, progress and the ultimate goal. This also ensures that the interests of the entire team are focussed in a single direction, with clear targets and enhanced task visibility across the members of the group. Your group tasks can be copied or moved to another streams group by choosing the appropriate options in the 'more options' menu. You can choose to exclude the comments in the original task when it's being copied or moved by unchecking the 'include comments' checkbox. Certain tasks are not one-time tasks, but keep repeating at a certain frequency. These tasks are called Recurring Tasks. You can create Recurring Tasks in Zoho Mail for tasks like Report Generation, Bill Payment, Timesheet submission and so on. 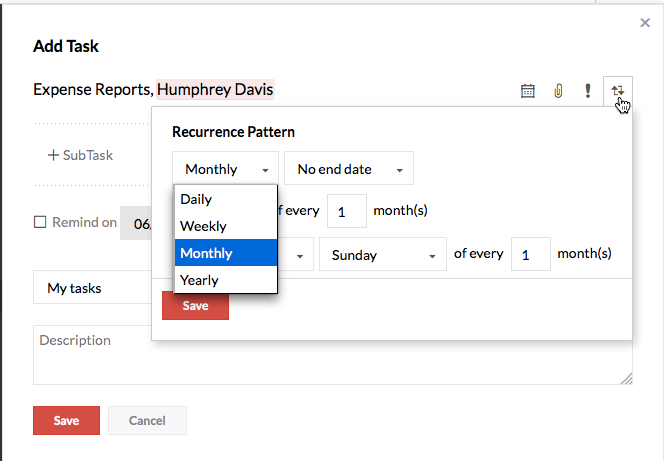 Click the Recurring icon to set the repeat pattern for the task. You can choose between the Daily, Weekly, Monthly and Yearly recurrence, with additional sub-options to choose the repeat pattern/ time and so on. A huge task can often be split into multiple subtasks. Group Tasks often involve the contribution of various members of the team, with each one taking care of a different subtask. Zoho Tasks offers a few pre-defined hacks to make your task management simpler. You can send an email to yourself in the specified format to add and manage Tasks in your mailbox. The subject of your email will be added as the 'Task Title' and the email content gets added as the 'Task Description'. Only the first 50 characters of the task get added as the description of the task. In case you're a personal account user, enter 'zoho' in place of the domain name. The task hacks that you email to yourself get assigned to you, while those that are emailed to the group email id get added as group tasks. You can open the Tasks application from within your mailbox and edit the tasks as and when necessary. These cheats will work only if the email is sent from a domain that's hosted with Zoho Mail. Zoho Projects Integration with Zoho Mail facilitates easy access to your Project portals and their respective Tasks from the Tasks App. It allows you to create a new Task directly in Zoho Projects or add an email as a Task/Bug under the desired Project portal from your Mail inbox. Refer here for more details about Zoho Projects integrations.